Obama: "Got it!" Boehner: "Uh-oh. What? I...this isn't what it looks like." 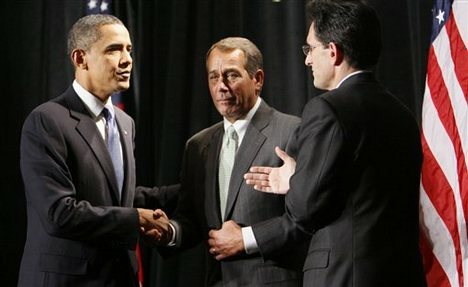 Cantor: "You ain't gettin' this hand." Compromise – it’s the word that Speaker of the House John Boehner (R-OH) eschewed as a synonym for “sell out,” when he spoke to CBS’ Leslie Stahl on 60 Minutes, one year ago, before he took the gavel from Nancy Pelosi (D-CA), in January. It should come as no surprise, then, that the third most powerful man in our government is meeting resistance, even within his own caucus, when it comes to implementing a basic and necessary tool used to mitigate government dysfunction. There will be no negotiated solution, no compromise, as long as Boehner, Leader Eric Cantor (R-VA) and House Republicans maintain an unassailable majority in the Lower Chamber. The numerical advantage enabled them to pull back from an apparent debt deal in the summer, and allowed Republicans on the ensuing Super Committee – which itself was supposed to negotiate a solution – to accept failure. And it pulled back Boehner’s hand at the current payroll tax cut extension agreement, because his caucus reminded him he would be branded a sell out. A somewhat cynical McCain took note of the dismal ratings of Congress in his critique. “It is harming the view, if it’s possible any more, of the American people about Congress,” he said. The continuing cries from the House of, “But our bill will be better. We want a whole year,” is falling on deaf ears because, as they acknowledge, everyone wants a whole year. What they, the Senate and the President want or are willing to exchange for that year, in a hurried negotiation, is the sticking point. By engaging in another post-settlement negotiation, John Boehner and Eric Cantor are substituting the “legislative realities” the Republicans like to talk about when they “negotiate” a bill, with legislative surreal-ities. And for the millions this legislation affects, the consequences of their political gaming couldn’t be more real. Maybe the voters will remember that, come November. For those of us who born in the US, and have lived here our entire lives, the American Dream is just a silly phrase. Most of us do not understand how radical and unprecedented the United States experiment with representative democracy truly was. I say was because baring some spectacular events in the coming years that experiment is over. For most of recorded history a very small percentage of people controlled everyone else. Slavery was accepted even by the slaves, though it went by various names including, caste system, feudal system, roman catholisism. Whatever your parents were, however they lived, however they were treated, that was your lot in life. There was a .00x percent chance that by some miracle you would not die exactly as you were born. The United States of America, started out in the parlance of the times borrowing heavily from the ancient Greeks. The wealthy land owning white men would get together and decide how to best improve the country and maintain control of the population. Unimaginably, this population rose in spectacular fashion. Through learning and discovery, education and physical social networking, it gathered around and idea and the populous demanded they be included in this incredible experiment. The result was an explosion of innovation, the harnessing of the willpower of millions who were working toward a more perfect society in which everyone born on our soil had a chance through education and determination to live a life of meaning and comfort, free from the shackles of tyranny and oppression, able to actually dare to dream. Not only did people have these dreams enmass, but these dreams became attainable, and upon seeing this, people from around the world risked their lives pouring into this country to have an opportunity to better themselves, to accomplish, to be able to participate, and to foster the next evolution of humanity. The opportunity to have a say in who shaped your world and how it was shaped was worth dying for. People were killed in droves by those who didn’t want them to have a say in the process. Yet they came, they voted, and they shaped America. today, on average, only about 54% of eligible votes in presidential elections. 37% in midterm federal elections, and a significantly smaller portion in state and local elections. Our country is shaped by the collective of all of the local elections. Those elections shape the state elections, which shape the federal elections, which shape the nominee for president. We as a people are at fault for the dream failing. 90% of us really have little or no impact on how this country is run, or who the people running it represent. The tragedy is not their actions, it is that they work for us and we haven’t fired them. The tragedy is that we are so dulled, so intellectually obtuse, so complacent, that we can’t even get off the couch to mobilize as we see the world our recent ancestors fought so hard to create crumble before our eyes. We see the rights that were so hard to attain be striped away, we see the constitution striped of meaning by monetarily driven people, many of whom don’t even know what it says. Our freedoms have been eliminated so gradually, so subtly and with so much posturing and misinformation that we didn’t even protest. We are so desensitised to it now that they just past a law allowing the indefinite detainment of American Citizens without trial and we didn’t even protest. We don’t even take the time to find out anything about any of the people who actually affect our day to day lives. We base our decisions on rehearsed talking points, and poorly made attack adds, or who’s signs we see more of on the highway, and thats only the less than 25% of us who vote in local elections. Money bought our democracy, a system that at its core can not be purchased. It doesn’t matter how much money is thrown at politicians if those who take it don’t get to come back. It doesn’t matter how much money a campaign has if people actually started picking people at a local level and actually paid attention. If the pool you pull from isn’t corrupted because they have been vetted by their record by all of the American people, then the result isn’t ineffectual every single time. The system isn’t broken because the banks broke it, not because congress isn’t doing their job. Its not because the FED counterfeits trillions of dollars of currency to pay off the interest on money it owes that the US should never have borrowed. Its not the president, its not moral bankruptcy, abortions, gays, or wars. The system isn’t broken because corporate interests are too powerful or because government officials are corrupt. In fact, the system isn’t even broken. We are. We are complacent, uneducated, and unparticipatory. We blame everything on everyone yet we don’t even vote. We the people of the United States of America have failed ourselves and each other, we have taken hundreds of years of the pursuit of a more perfect union and the most incredible time of innovation in human history and turned it into a testament to human ineptitude, greed, sloth, and defeatism. Instead of complaining about the failings of the system, the corruption of government, or evil corporate empires, why don’t we just participate in our democracy. If we do then it will actually reflect what we the people believe. This fact is astonishingly, beautifully, powerfully simple, and yet we have forgotten. Its time to remember.